Renege, Retraction, Recantation and Repudiation are the diplomatic devices in the US statecraft which have been flagrantly resorted to by the US administration ever since it has acquired unassailable scale and stature in recent years. The US has been following the practice which I call “Unilateral Retraction from Global Entities & Treaties” (URGENT or Diplomacy of URGENT) in violation of global multilateralism, global constitutionalism and the global rule of law. US is a country that examines the human rights records of other nations and releases annual Human Rights Reports as a part of its pompous advocacy of human rights, the ostentatious championship of the rule of law and narcissistic foreign policy based on the absolute supremacy of US interests worldwide. On June 19, 2018, Nikki Haley—US Ambassador to the UN—declared the repudiation of US membership of the UN Human Rights Council (UNHRC) that has bomb shelled the UNHRC, and stunned the UN and flummoxed the rest of the world. The latest US position on UNHRC has created wide-ranging implications for the global human rights system and its functionalism. However, there was no astonishment in the US under Trump Presidency announcement as the international community got considerably accustomed to US volatility on global issues; for example, US retraction on Kyoto Protocol-1997, recantation on Paris Agreement-2015 (COP-21),cart wheeling the NAFTA, flip-flops on Iran Nuclear Deal and its summersaults on the WTO membership. The latest US renege from UNHRC has been there in the offing ever since the UNHRC President Vojislav Suc has mooted stopgap reforms proposals—Ambassador of Slovenia— to justify and streamline the UNHRC functioning, and enhancing its efficiency. However, these reform proposals have already been rejected by the EU (European Union) led by France, Belgium and Portugal and OIC (Organization of Islamic Cooperation). However, the rejection per se shall have an additional implication for the US due to its opposition to UNHRC Agenda “Item 7” where under debates hitherto have been directed at the conflict between Israel and Palestine, human rights of the people of Palestine and the Arab States every year. 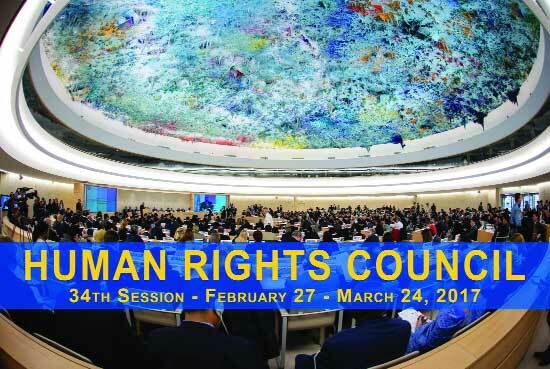 The UNHRC on June 30, 2006, voted to institutionalize permanently the Review Mechanism known as “UNHRC Agenda Item 7” to assess the human rights abuses committed by Israel at each UNHRC Session. Primarily, the impugned proposals intended to abdicate the current practice of addressing and debating the every UNHRC agenda item at every HRC Session that is convened thrice in a year. But the new reform proposals made provision to club together all agenda items and debates there under which have been alternated across the three annual UNHRC Sessions. In principle, the US is utterly opposed to the “UNHRC Agenda Item 7” based on its flawed understanding that it is an institutional prejudice against the State of Israel whereas rest of the severe human rights abuses across the world are addressed under “HRC Agenda Item 4.” In July 2017, Haley stated in Geneva that the “UNHRC Agenda Item 7” is scandalous measure against the State of Israel and it does not have any legitimacy to exist. Though, the US objection on “UNHRC Agenda Item 7” is not new. The US Ex-President George W. Bush wanted to disengage from the UNHRC in its infancy years, but the US could thwart the adoption of the impugned UNHRC Agenda Item 7. However, in 2017 US allies led by the UK and the Netherlands mollified the US to accommodate the UNHRC Agenda Item 7 for an ephemeral period for its dilution under a UN General Assembly (UNGA) Resolution that still remains a distant dream. But, the more significant issue is as for how to improve the UNHRC Agenda that incorporates other US demands as well. The UNHRC Agenda could be improved by enhancing the membership of the UNHRC to attend the wide range of global human rights issues. In this context, the Universal Rights Group (URG) convened an informal consultation with the help of the national governments of the UK, the Netherlands, Latvia, Mexico and Rwanda on December 01, 2017 in Geneva to strengthen the UNHRC. Around 120 States participated in the Consultation along with the UN representatives, NGOs and other selected stakeholders and all of them negotiated and brokered several key improvements that included the restructuring of the UNHRC Programs by clustering and rotating the UNHRC agenda during the year, and inculcating the highest degree of transparency in the UNHRC functioning, elections, and membership under the auspices of UNGA. Thus, these reformative steps have been reflected in the formal process initiated by Ambassador Suc in January-February 2018 and that too from a US point of view. But, unfortunately, Ambassador Suc got a dent in his initiatives from his own backyard i.e. the EU particularly from Belgium under the influence of Western Human Rights NGOs against any clustering and rotating the UNHRC Agenda Item 4, France and Portugal. It has been argued that the UNHRC Agenda Item 4 must be part of every session of the UNHRC due to its importance. Simultaneously, many Global South countries especially from the OIC expressed their reservations against any dilution of the UNHRC Agenda Item 7 that, ultimately, disenchanted the US and its allies. Initially, the nation-states were not properly guided in their opposition and it was the intent of the founders of the UNHRC that the members would cluster and rotate all agenda items across the three annual sessions of the UNHRC. In fact, it was not there in the initial understanding that UNHRC would decide every agenda item at every UNHRC session as per UNHRC Resolution 5/1in accordance with the IBP (Institutional Building Package) that was adopted by the UNHRC in June 2007.Similarly, Section VII read with Rule 8of the IBP states that at the beginning of each year, the UNHRC shall hold a meeting for the purposes of organizational, planning, and programme the work for the year, including tentative dates of consideration of the UNHRC Agenda Items and the number of meetings to be allotted to each agenda item. But these institutional directives were not heeded to in a regimental manner rather subsequent UNHRC Presidencies have not been active to adhere to the UNHRC mandate as per the IBP procedural mechanism for tangible results for the betterment of human rights around the world. In such a scenario, the UNHRC has provided an opportunity to the US to withdraw from the UNHRC on the cosmetic ground of non-deletion of the UNHRC Agenda Item 7 and non-compliance of US desire of changing the UNHRC membership rules under the UNGA Resolution just to consign gross human rights transgressions into the dustbin. However, the US had made every effort to make its comparatively constructive and potentially pragmatic proposal materialized by circulating the Draft Text among its allies in Geneva on December 01, 2017 meeting at a time when the US decided to move its Embassy to Jerusalem. Therefore, it did not receive immediate support due to their anxiety about the process of critical institutional changes via ordinary resolutions moved by a single state. Thus, such a US modus operandi generated trepidation among the member states that in future, such a process might be appropriated by the other nation-states that would make the UNHRC invidious and in fructuous. Therefore, the US exit narrative originates from the moment when States botched the UNHRC President’s February proposals. The primary responsibility for such an unfortunate move will have implications of far-reaching consequences worldwide. 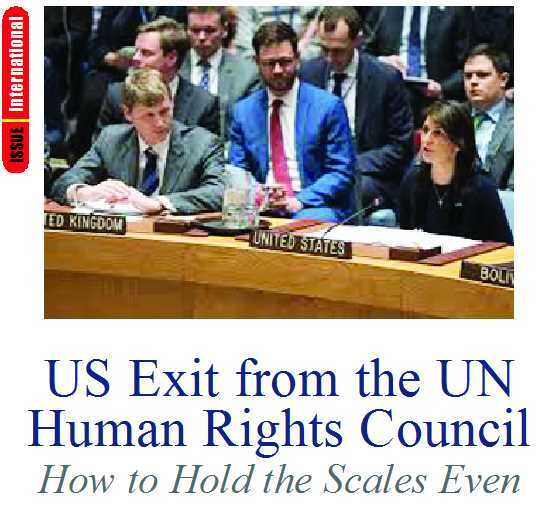 The US exit from the UNHRC would hurt the US most and it would also scale down its global influence and advocacy for human rights, the rule of law and democracy. Further, the US move will make the state of Israel more vulnerable at the UNO and the US recantation from the UNHRC has established that there are profound doubts about the US commitment to multilateralism. The incumbent US President advocates a review of all multilateral agreements and treaties except treaties on extradition, security and trade. However, he does not like trade treaties due to his belief in US domestic trade protectionist policies. Under the US law, the ratification of the international treaty is extremely cumbersome. Legally speaking, there are three kinds of international agreements in the US. The US Senate ratifies a treaty by two-thirds of the majority. A US Congressional-Executive Agreement requires only a majority of the both the houses of the Congress. However, US President has the capacity to make a sole Executive Agreement himself,and he can also terminate an international treaty at will as well as congressional agreements. But such a situation of exercise of presidential powers have been examined by the US Supreme Court in Goldwater v. Carter, [444 U.S. 996 (1979)] when President Jimmy Carter acted without Congressional approbation and unilaterally terminated a defense treaty with Taiwan that raised a question with regard to the constitutional role of US Congress to play in the termination of the treaty. The President Carter reasoned that since Congress had not formally challenged his authority, therefore, technically the case was not justiciable. The US Supreme Court judges were divided and they found that the case involved a political question as per the Justice Rehnquist who led a group of four justices. Justice Powell was of the opinion that the impugned case was not fit for the judicial review. However, the dissenter justices in the matter were willing to hear the case as the US Congress opposed Carter’s action. Similarly, the Goldwater situation may be replicated if the incumbent US President Trump tomorrow decides to pull out of North Atlantic Treaty Organization (NATO) and US Congress challenges the powers of the US President in this regard while voting to stay in the NATO. But such a situation would warrant the Court intervention to resolve the question of separation of powers between two political wings. The Iran Nuclear Deal is a global but limited political arrangement whereas the Paris Climate Pact is a sole executive agreement and President Trump withdrew from it under the US Law. However, the UN Framework Convention on Climate Change (UNFCCC) is a better and faster option to retract from its commitments. But the majority of the US states would remain committed to the COP 21 arrangements. On the other hand, NAFTA is a regional treaty and its implementation depends on the domestic statute and subject to the objection of the US Congress and its overriding by the President. Therefore, there is a necessity of a balanced approach to address the existing treaties in the US. However, the many human rights Conventions have not been ratified by the US government such as 1989 UN Convention on Rights of Child but Trump is positive to ratify the 1979 UN Convention on the Elimination of All Forms of Discrimination against Women. There is a question; is there the death of treaties if the statement of Oona Hathaway—Professor of Law of Yale Law School—is to be believed. But, unfortunately, today’s world is confronted with a US administration that embraces the diplomacy of URGENT for all kinds of entities and treaties. Notwithstanding of the probability of accomplishment of the US proposals for reforming the UNHRC is an important trend in the international law. However, the Brexit of June 23, 2016, is regarded as the most well-known example of this trend that is perceived as a nationalist impetus in the UK. Since 2012, as many as eight nation-states have exited the United Nations Industrial Development Organization (UNIDO) attributing the lack of efficiency. In 2016, President of the Philippines Duterte threatened to pull out of UNO due to the UN castigation of extra-judicial killings in the Philippines. Similarly, African Union in principle has endorsed the mass withdrawal from the International Criminal Court. Thus, should international community accommodate such an anti-intergovernmental and anti-international treaty obligations trends in the contemporary world order as it is being wrongly encouraged by the US and it may turn out to be the death for international treaties. The unilateral exit or unilateral denunciation of treaties remains highly contested question under international law. It is generally understood that treaty obligations terminate in both national and international law after a nation-state withdraws from the treaty. Treaty exit makes an impact on both legal systems but there are some treaty exits that divide the status of a treaty by closing its obligations in the municipal legal system but continuing its obligations under international law. But in case of human rights obligations, such a division of treaty exit is not tenable as human rights obligations are protected under the customary international law (CIL) and the US cannot escape from its international human rights obligations under the CIL. The US has been compromising its diplomatic decency, international integrity, and global human rights credentials that would lead the US towards in state of diplomatic darkness. The state behavior of the US has established that it does not have any respect for its international human rights obligations. Such US measures are bound to create a New World minus the US due to its blind love for Israel that has been committing war crimes against humanity of Palestine, circumventing the international law and violating the purpose and principles of the UN Charter. But there is still some global optimism left provided Haley’s advocacy of US reform proposal is reconsidered in the current year, i.e. 2018 itself.The US Courts exercise their powers of interpretation by not allowing the US Congress to violate the US’s international human rights obligations. A self-executing treaty provision is the paramount US law that has same status available to a federal statute which is justiciable by the private parties. 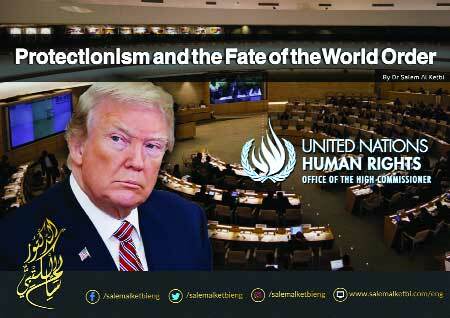 The US as a liberal, multicultural and cosmopolitan nation-state has to espouse its human rights obligations under international law along with their socio-economic, geopolitical, and diplomatic costs.The US commitment to human rights space in Global South face a critical juncture between US-led “Israel-induced Push” and universal “UNHRC-institutional Trust” that can outpace the hegemonic and imperial tendencies of the overriding US national interests.Therefore, it is equally desirable that the US must have the negotiations based on the strengthening the UNHRC institutional framework to establish its global commitment to human rights. The writer studies LL.M. in Public International Law at the South Asian University, New Delhi.